COMMENTARY ON "THE RESTORATION OF ALL THINGS"
"It’s called the Fall. It’s called sin. It’s called rebellion, and it’s called the great controversy." For the Adventist Great Controversy doctrine to be a true explanation of the evil that exists in this world then the foundation for that belief must be found in Scripture. The two common biblical references normally referenced by Adventists as biblical support are found in Isaiah chapter fourteen and Ezekiel chapter twenty-eight. Yet neither reference supports the explanation given by Ellen G. White for Lucifer's (Satan's) jealousy. For an orthodox evangelical Christian it is unethical to promote The Great Controversy doctrine as an explanation of the evil that exists in this world without providing a biblical foundation for such a belief. Assuming it to be true because it 'sounds right' to unregenerate sinners is proof of nothing. Adventist compound and promote this error through the acceptance and use of the unofficial publication of the Clear Word paraphrase of the Bible where in Jude 1:9 it outrageously renders it to read; "Jesus, also called Michael the Archangel". Since Jesus always was eternally the Son of God equal with the Father it is heresy to suggest he is or ever was anything less than fully God. This is the reason well informed orthodox Christians object to the Adventist Great Controversy doctrine. No doctrine or any other belief is any better than the foundation upon which it is built no matter how 'right sounding' it may appear to be. "They alone, among all the other creatures made during that time, were in God’s image. They were not evolved apes. As human beings, they and we are radically different from all of the other life forms on earth, and any theology that lessens this difference degrades humanity." Instead of what may or may not 'degrade humanity' our commentary for today will address the issue of how Adventist theology "degrades" the sovereign work of God. What it means to have been created in the image of God will be part of tomorrows commentary. As we will see in tomorrow's commentary 'the breath of life' is a metaphor for something unseen that God breathed into Adam. That something died when they sinned and required the shedding of perfect sinless blood before it could be brought back to life. On the day Adam and Eve sinned God warned that they would die yet they had physical life for many years afterwards. In the biblical creation account this is the only instruction God gave Adam that contained a condition. That is, if Adam did not do as instructed there would be an immediate negative consequence. Adam and Eve both ate of this one restricted tree and they did die on that day yet experienced physical life for many years afterwards. The human race was originally created with a human spirit that died on the day Adam and Eve sinned. Therefore, before sinners can enter into the kingdom of God their dead spirit must be reborn. Jesus uses "the wind blows" as is a metaphor for the unseen working of the Holy Spirit. This reveals to us that "the breath of God" is the very same metaphor for the unseen work of God that gave spirit life to the human race at creation. The subject of today's lesson is the Adventist version of 'the plan of salvation'. The lesson refers to "Christ's sacrificial death" as "the crucial and foundational step..."
In speaking directly to the Serpent (Satan) God proclaims that there would be enmity between Satan and the woman which would to be manifested in two related ways. The second understanding is in the veiled prophetic enmity that pointed to Calvary where Satan would "bruise" the heel of Jesus but Jesus would "bruise" the head of Satan. Satan's "bruising of the heel" was a temporary 'flesh wound' wherein Jesus would spend three days in the grave. The other was a death warrant for Satan because when Jesus came back from the grave at his resurrection it proclaimed to Satan that his future is to spend eternaty in the Lake of Fire. "Though this restoration won’t be completed until the new heavens and the new earth, the process already has begun in us now!" On-the-other-hand, as stressed earlier this week, restoration (communication and fellowship with God) occurs at the moment a sinner responds to the gospel message through Jesus' gift of the indwelling Holy Spirit, who at that instant in time gives new life to our dead human spirit. Note: Since Romans chapter eight is the 'high point' of the Christian faith be sure to continue on and study the whole of this chapter. 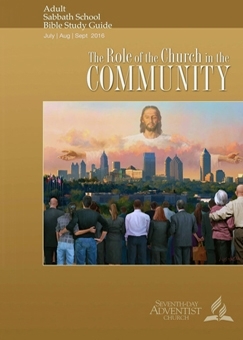 The lesson speaks of 'the restoring role of the church'. According to Scripture just what is 'the church' and what did the Lord commanded it to do above all else? Earlier when Jesus gave Peter "the keys of the kingdom of heaven" it was founded upon the understanding that no power of heaven or hell could prevail against the power of God, Matt. 16:13-20. Therefore consider the meaning of the unbroken existence of the church along with the assurance given to those within this creation of God. If God is for us who can possibly prevail against us? Since no power can prevail against what God has created there is no biblical justification for the Seventh-day Adventist's claim to be the one and only true remnant church that has restored what has been lost. When Jesus says "to the end of the age" he wants us to understand that nothing can possibly interrupt or prevail against the power of God right down to the end of this age we are now in. Instead of presenting a summary or application of the biblical gospel message the quarterly lesson talks of the church (meaning the 'remnant' Seventh-day Adventist denomination) restoring God's image. As has already been stressed in this week's commentary 'restoring God's image' is the work of Jesus Christ through his gift of the indwelling Holy Spirit who brings our human spirit to life at the moment we respond to the biblical gospel message and accept Jesus Christ as our Savior. It is Jesus' shed blood at Calvary that atones for our sins, which includes no work of our own. Yes, as Saints of God, we are to 'walk' a life of good works, yet those works are not the gospel message. Instead, they are is the result of the atoning shed blood of Jesus Christ. Since these works are the result of the power of Jesus Christ, even in this there is no boasting of oneself. Copyright 2016 BibleStudiesForAdventists.com. All rights reserved. Revised June 21, 2016. This website is published by Life Assurance Ministries, Camp Verde, Arizona, USA, the publisher of Proclamation! Magazine. Contact email: BibleStudiesForAdventists@gmail.com.